... the versatile programming, energy tracking and wireless capabilities of Infinity Touch; and the superior energy savings of geothermal. ... solution that covers central heating of the house as well, you should choose a Compact P solution with an outdoor air or ground source heat pump. The geothermal heat pumps draws heat from ground water or the ground itself via horizontal or vertical intakes. The pump concentrates the heat for re-diffusion into a water heating system for home hygiene or central heating (radiators or radiant floor heating) or individual fan-coil units. ArchiExpo offers a wide choice of geothermal and aerothermal heat pumps. 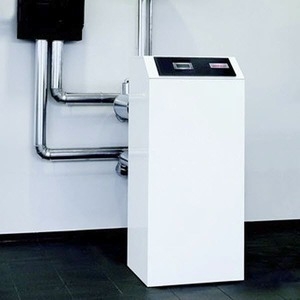 The heat pump produces hot water for hygiene and space heating. There are reversible, heating/cooling models. The geothermal heat pump is a thermodynamic system using heat stored in the ground for home heating. Intakes transfer heat to the pump via a heat transfer fluid. Horizontal intakes extend over a large area at a shallow depth. Vertical intakes consist of two elements placed 10 meters apart; they descend to a depth of 20 to 80 meters. The pump transfers energy to heat water for home central heating via radiators or radiant floors, or via individual fan-coil units.